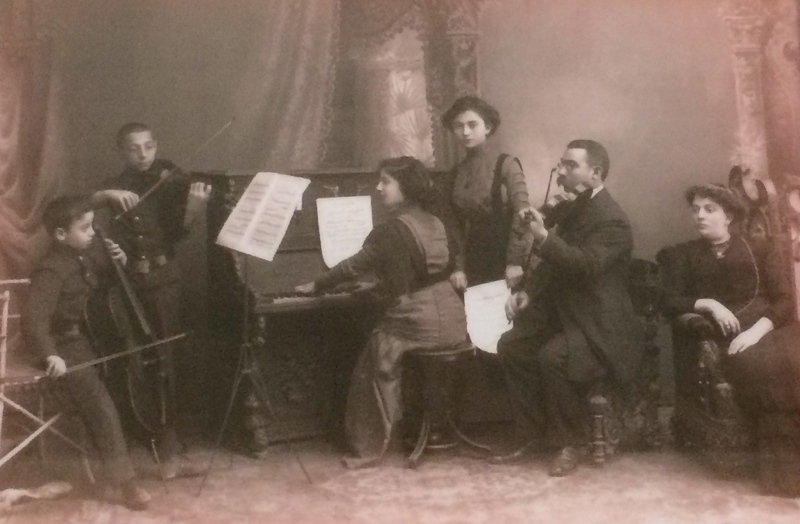 From left to right: Menia (my father), Monia (on violin), Bertha (pretending to play the piano), Bronia, Father (my grandfather), Mother (my grandmother). Probably taken in 1909 or 1910. [My father died at the end of January 1986, just after his 84th birthday. When he learned he was dying, he began to write a memoir of his early years. He didn’t get as far as he had hoped before he felt too weak to continue. So what I am offering here is all there is. Since English was not his native language, I’ve cleaned up his manuscript a bit. But not too much. I did try to preserve his locutions, to give you the flavor of his speech. By this time, I found out I had an Uncle; he was Father’s brother, who also arrived with his family to Baku when we did. His family consisted of his wife, two girls named Sifa and Mania and two boys named Solomon and Boris. The girls were a little older than I, but the boys were younger. Uncle’s name was Isaac, which he promptly changed to Russian name Alexander; his wife’s name was Enaia, which remained same for the rest of her life. They lived close by, and the boys became my playmates. My father’s name was Nachum-Leib, which he too changed to Nahoum, or in Russian, Naum. Mother’s name was Sima, but Russified her name to Sonia or Sophie. Both of my sisters also changed names, from Beile to Bertha and from Broche to Bronislava. (Beile in Jewish meant “beautiful” and Broche meant “prayer!”) My brother’s name was Moses and in Russian Moisei, and that’s the way it remained till we came to America, when it became Morris. My name was Mendel. Why I got it and what it meant I never knew. All I knew is that I did not like it. I took the Russian Revolution as a good opportunity for me to change the name to Michael. During the first months of Revolution it was comparatively easy to get hold of documents with the new name, and from then on all other papers could be changed to Michael too. But at home I was always called Menia or Menichka, and my brother Monia or Monichka, although the sisters were called by their Russian names. My father also had a sister called Dunia. She was married to a man by the name Rossinsky. By profession he was a cap and hat maker for men. He could make very fancy, and I thought very beautiful, hats for officers and other officials, and regulation hats with visors for Gymnasium students. He always made hats for me and my brother, but that was later, when Father brought his sister and family also to Baku. About the same time, Father also brought to Baku his own Father and Mother. He settled them in a room separate from our dwelling but close by. By that time we had moved from our apartment into a huge building in the commercial part of Baku, where Father and Uncle opened their first store together. The building had many stores and also housed a Gymnasium for boys. The stores had entrances from the street and also from the rear, which opened to a huge back area, more like a ball park. The building was owned by a Azerbaijanian Moslem (tatarim) who hardly could speak Russian. He chose Father as advisor in his dealings with Russian officials as well as to take care of all his official paperwork. Father became his right hand in dealing with Russian officialdom! He used to arrive in a magnificent carriage with three fine horses, surrounded by his cronies. His name was Gadji-Aga Gadjieff, and he was an enormously rich man. But his sense of humor left me flat. Once, I remember, he arrived in the spring to see Father at the store and had to wait a bit as Father was out, so noticing me in the office part of the store, he casually asked in broken Russian what month was it. I said, “May,” to which all of a sudden he broke out again in broken Russian, “Ya perdnu a ti poimai!” “May” and “poimai” rhyme in Russian, but the meaning is very stinky. It meant, “I will let out a fart, and you catch it!” I was taken terribly aback, not expecting anything like that from such a V.I.P. person and was speechless! But the V.I.P. burst out laughing, joined by his cronies, for a very long time. Almost till Father got back to the office. Such delicate sense of humor! My mother also had a brother. I never saw him, but I knew of him because he had a candy factory in Odessa and was sending us from time to time packages and boxes of his candy; they were very fancy, wrapped up in papers with pretty pictures on them. Mother’s Mother was living somewhere in a little village in Ukraine — alone, as Mother’s Father was always traveling all over Russia, but mostly in Siberia, representing book publishers and selling books. I met this Grandfather only once, when he came to visit us in Baku. He was a handsome tall man, with a huge white beard and completely bald head! He liked to drink Vodka. I guess in Siberia it is a must to keep warm! My Father was very deferential to him, as also to his own Father. This Grandfather did not stay long with us, but before he left he was very generous with his grandchildren. I do not know what he gave to sisters, but he gave a lot [of money] to Monia, for him to buy a fine violin and a beautiful photo-camera. I got nothing! I received Monia’s old camera, which I did not like and did not want! I never did use that camera! Mother’s Mother, our Grandmother, was later to stay with us for a few years and once in the summer we all went to her village and spent our summer vacation there. But about all that later. In our family, no one wore glasses except Father and us two boys. We were nearsighted. All others had fine vision all the time! Father’s goal was to bring out all of the relatives to Baku from Ukraine, and that required a lot of money, which I imagine was not forthcoming in amounts needed. 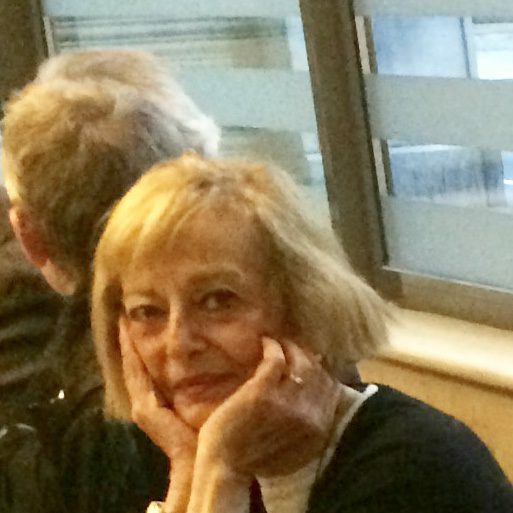 And so, coming back to the time when we lived nicely in our apartment with a maid — I was about five then — we had to move and lower our living standards. We moved to the building I described where the store was located, on Borgovaia Street II (Commercial Street II), into small quarters next to the store. Later we moved again to live in the back of the store. The store was huge in length and so it was easy to partition it off — in the front for the store part, and in the rear for living. Still later on, another store was opened and Uncle and his family set up living quarters in the other store’s back. My uncle Alexander, in contrast to my Father, had a great black beard which he always groomed and was very proud of. He did not wear eyeglasses and neither did anyone in his family. My Grandfather (Father’s Father) was a very religious man; he was also bearded, with a great white beard. He was most of the time praying in synagogue or at home. He liked my brother very much but did not care much for me! My GrandMa was a nice little lady and liked me very much; I was visiting her often and she always had cookies and cake for me, something I got very rarely at home. Once, on a Jewish holiday, she even poured me a small glass of vodka with the cake. Vodka for a five year old! Needless to say that I was drunk for the rest of the day! Mother was furious! And that was the end of visits on Jewish holidays to GrandMa. In our house there was never much religion. Father would go to synagogue on big Jewish Holidays, and also celebrate Passover with all ritual during meals. Mother would pray over candles lit on Fridays, and there were no un-kosher meals during Passover and no un-kosher dishes. Also there was no cooking on Saturdays; all the cooking was done Friday and the meal was kept warm till Saturday. But that was all. My Grandfather and GrandMa lived near us until GrandMa died. I saw her in coffin and cried! After that, GrandPa left Baku and I never saw him again. I think that he left for Ukraine, where he was more at home with other religious friends near the synagogue. The huge store building where we lived had also in the center a great gate from the street through which students could walk to Gymnasium and carriages could enter the premises. In the summer, an open-air movie house opened inside the open area in the yard, and Father had a key to the private box that belonged to the rich landlord, so I was the first customer for the first show every evening. I loved movies! By now I was about six years old. The year was 1908. The two stores did not work out too good, and Father and Uncle decided to combine both stores into one, but both retained the back parts of the stores as living quarters for each. The front of one of the stores was given to Sister Dunia and her husband the hatmaker, and they established a thriving business for themselves. He was an excellent worker and very ambitious; he was at his sewing machine from early in the morning to late at night working, increasing and selling his inventory of caps and hats. Father and Uncle were working together in the other store, which they stocked with various merchandise all imported from Germany: sewing machines, knitting machines, bicycles, phonographs and records, different kinds of musical instruments, strings, etc. Apparently, they were doing well. They had a system whereby each would take in all the cash that came from sales every other month — six months one partner and the other six months the other partner. Each one, after taking out equal amount of money for living expenses, would put the excess into a fund to pay business expenses and for the merchandise. Father would go about twice a year to Germany on his buying trip, and Uncle would tend the store. Uncle was a good mechanic (also self learned) and was very good at fixing all sorts of mechanical problems with the merchandise. By that time, Monia was already going to the Gymnasium, located in our building. The Gymnasiums in Russia were official schools of learning, and the diploma from the Gymnasium was necessary to be admitted to any institution of higher learning, like University or Engineering School. In Tsarist Russia there was a quota for all Jewish children that could be admitted to any institution of learning except private schools, whose diplomas were not accepted at University or Engineering School. Jewish quota for all officially approved schools was 10%; if the class consisted of forty students, only four Jewish children were admitted. The admittance for everyone was by examinations, but the competition for the few Jewish places was fierce, especially where the Jewish population was large. In Baku, there were very few Jewish families at that time and even less Jewish children of school age. So for Monia it was comparatively easier to be admitted to the Gymnasium. But when the time came for me to apply, it was a very different story!